Gavin Newsom's departure from the governor's race means less great material for reporters unless some other Democrat steps up to take on Jerry Brown. In a race between San Francisco Mayor Gavin Newsom and California Attorney General Jerry Brown for the Democratic nomination for California Governor, Brown looked like a likely winner. Partly because of polls, but also because of fundraising -- Newsom apparently didn't want to bother with the hard fundraising work, instead relying on fantasy projections of millions raised online through Twitter and Facebook. But that doesn't mean someone else won't step up to take on Brown. Senator Dianne Feinstein, who has previously run for governor, would beat Brown in the primary, according to polls conducted earlier this year, but Feinstein has expressed little interest in the job, at least publicly. Congressperson Jane Harman, who represents Venice in Southern California, is independently wealthy and has name recognition in the more populous southland. Former San Francisco Mayor Willie Brown floated Maria Shriver's name, but even as a Democrat, she would be hard-pressed to distance herself from the legacy of her husband, current Governor Arnold Schwarzenegger. State Controller Steve Westly has also run in the past, but was unable to beat real estate developer Phil Angelides in the last primary, so it's unlikely he'd stand a chance against Brown. Los Angeles Mayor Antonio Villaraigosa ended speculation about a rumored run for governor just a few months ago, which left Congressperson Loretta Sanchez on the tip of political tongues as another southland Democrat with likely appeal to latino voters. If there's a dark horse, it's likely State Treasurer Bill Lockyer, who has millions already raised in a campaign warchest, but has said he plans to seek another term as treasurer. Newsom's departure also raises questions about San Francisco's future. While there are rumors he might instead run for lieutenant governor, a victory would allow the Board of Supervisors to appoint his replacement -- and no Newsom supporter likes that scenario. Which means that Supervisor Bevan Dufty, the only declared candidate for mayor of San Francisco after Newsom is termed out in 2011, definitely has two years of campaigning ahead of him. It will be interesting to see the moves other likely candidates make, including City Attorney Dennis Herrera, Public Defender Jeff Adachi and Supervisor Ross Mirkarimi. 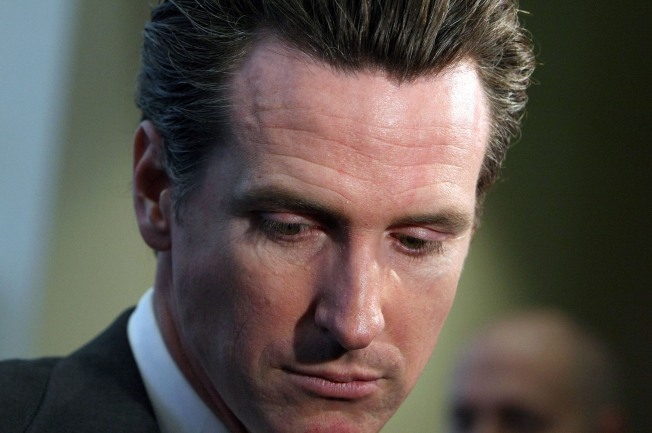 If they learned anything from Newsom, it may be time to start dialing for dollars early and often. Jackson West figures a Brown nomination is inevitable unless Harman, Sanchez or certainly Feinstein make a splashy declaration.